How can a community close a coal plant and produce clean electricity, respect the needs of its community members, and provide a just transition for power plant workers? A successful, multi-year campaign by community members in Holyoke, Mass., to address air pollution and related public health impacts from the coal-fired Mount Tom Power Station and push for clean energy provides a powerful model. As a new video about this campaign by the Toxics Action Center shows, community efforts were instrumental in closing the nearby plant. The campaign didn’t stop there, however. It pushed for initiatives to help plant workers transition into new careers or retirement and to develop a new solar and energy storage facility to replace the plant. In this episode of Local Energy Rules, ILSR’s Energy Democracy Initiative director John Farrell digs into this story with Lena Entin, deputy director of the Toxics Action Center and board member (as well as former community organizer) of the grassroots, Latinx-led economic justice organization Neighbor to Neighbor. Working in close partnership, Neighbor to Neighbor members and the Toxics Action Center built and supported this community-driven campaign that provides important lessons and inspiration to other communities fighting to transform the energy system. Listen to the episode, read a summary, and explore resources including a transcript of the conversation, below. John Farrell: How can a community close a coal plant, and produce clean electricity, respect the needs of community members, and provide a transition for power plant workers? Lena Entin is the deputy director of Toxics Action Center as well as a board member, and former community organizer with the grassroots economic justice organization Neighbor to Neighbor. She tells the story of how her multi year campaign to end the public health threat from a coal plant in Holyoke, Massachusetts ended with a new solar array, the state’s largest energy storage facility, and several initiatives to help plant workers transition after the coal plant’s closure. I’m John Farrell director of the Energy Democracy Initiative at the Institute for Local Self-Reliance, and this is Local Energy Rules a podcast sharing powerful stories about local renewable energy. John Farrell: Lena welcome to the program. Lena Entin: Thank you. It’s great to be here. I really appreciate you inviting us. John Farrell: Well, I am so glad to talk to you because there are so many different communities across the country that are host to old power plants, and many of them are closing down. In fact, 2018 was a banner year for retiring coal power plants across the United States because they often can’t compete with renewable energy resources. 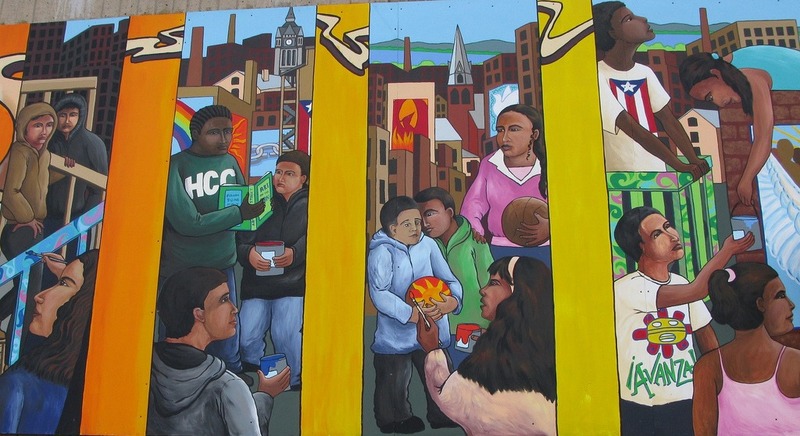 What has happened in Holyoke, Massachusetts caught my attention, because the change was really driven from the bottom up by organizing. I was hoping you could tell us a little bit about how this campaign you were involved in started, and I think it was all the way back in 2010, if I’m not mistaken, that things kicked off. Lena Entin: That’s right. It was a long hard fought campaign. 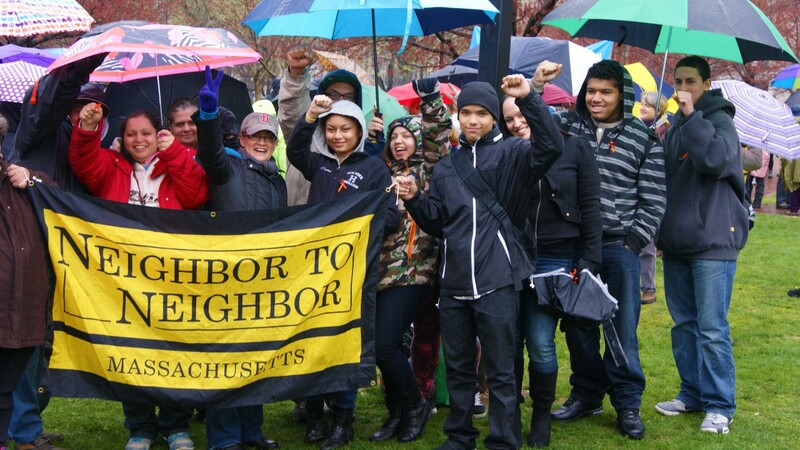 And so, in 2010 Neighbor to Neighbor members … Neighbor to Neighbor is a grassroots organization that builds power in poor communities, working class communities, and communities of color across Massachusetts. And we were organizing in Holyoke around economic justice issues, fighting for local jobs when we got wind that local activists were considering taking on closing the Mount Tom Coal Plant that had been polluting the air for 50 years. And so, we learned more about the coal plant, and learned that the pollution from the plant gets into the air, gets into our lungs, and can activate asthma, cause respiratory problems, heart problems. And Neighbor to Neighbor members started digesting this information. And Carmen Concepción said, “I carry an EpiPen, because my grandfather …” Her allergies are so bad, and her respiratory problems so severe that, “I never know when it’s going to turn into a severe attack where I need an EpiPen.” And Rosa Gonzales tells this story of not being able to hold down a job, because she’s in and out of the hospital so much every summer with respiratory problems. And Virgenmina Perez talks about her grandson who was born in the ICU, first three months of his life in the ICU with respiratory problems. So, we quickly realized that this environmental health issue is urgent, and it’s really at the crux of the job issues that we’re working on. That actually it’s this environmental health issue that’s keeping people from being at work, for example. So, Neighbor to Neighbor members decided we wanted to take this on. That Neighbor to Neighbor members wanted to organize to shut down the coal plant sooner rather than later. And I say that because of what you mentioned that coal plants around the country were starting to go offline. We wanted to close the plant sooner rather than later, and at the same time Neighbor to Neighbor members were acutely aware that, for example, in Salem, Massachusetts the coal plant was being converted to a natural gas plant. And Carlos Rodriguez talked about gas pipelines exploding along the highway, by homes, in communities in his hometown in Puerto Rico, and was adamant that we would not let this coal plant transition to another fossil fuel burning entity. And at the same time we also knew that we wanted to make this transition work for the workers, and for the town because Carlos, Rosa, Virgenmina they had all lost their jobs, been laid off, when their companies moved abroad. Rosa tells these stories of spiraling into depression when she lost her job, and then it was because the state provided job training to transition her that she was able to boost her confidence, and get back out there in the workforce. So, from the beginning Neighbor to Neighbor members really had this vision of how to take this on. So, that’s a little bit of the beginning of the story. John Farrell: Yeah. You know, one of the things I think was so great about your work with Neighbor to Neighbor, and Neighbor to Neighbor’s involvement is that so many of these stories are just environmental ones, and, as you alluded to, this was much more than an environmental thing. You were looking at what was the human impact of the pollution. People not able to get to work, people concerned as well about what will replace this coal power plant. Can you tell a little bit more about like who was joining this campaign? Because it wasn’t just a bunch of environmentalists saying, “We need to close a coal plant.” In fact, you sort of got wind that some environmentalists were working on this, but your organization brought a lot of different people to the table looking at this from all of the different angles. From an environmental angle, from a jobs piece, kind of from a future of the community piece. Who all were you bringing to the table? Lena Entin: Right. What’s really interesting was that this was actually the first environmental justice campaign that Neighbor to Neighbor took on. Neighbor to Neighbor was an economic justice organization before this point, and that’s really where Toxics Action Center came in. That we reached out to Toxics Action Center, because we said, “We’ve worked on economic justice. We’ve worked on passing bills through the state house. We’ve worked on local ordinances. But we have never taken on a company, nevermind a multinational company, the second largest utility company in the world.” And that’s where Toxics Action Center came in. That Toxics Action Center expertise is really working with new activists, people who are new to, for example, a corporate campaign. And Claire Miller, the local organizer, drove out and really walked us through the research that they had done about this company. Seeing that GDF Suez actually has a green image online. GDF Suez has wind turbines all over their website. So, we quickly partnered with Toxics Action Center, who was able to help us not only think about what a corporate campaign would look like, but also learn from other local groups that had been working on similar issues. For example, from the group in Somerset, Massachusetts we learned from activists there that they were a little behind the eight ball when paving the way for this transition. They had worked with the city to put together a plan for transitioning away from coal after the coal plant had shut down, or when it was on the brink of shutting down. And we said, “You know what? The city council does not see the writing on the wall yet. They’re not ready to lose this tax space, but this is the moment that we need to work with the city council on coming up with a plan. So, what’s going to happen when and if the coal plant closes down?” And then at the same time we also reached out to other partners. Unions, for example. Neighbor to Neighbor had always worked closely with United Auto Workers, Service Employees International Union 1199. So, organizers for these unions with Jobs for Justice all joined our steering committee, and agreed that this was really an important environmental health issue. And this helped us then reaching out to the plant workers union. What we did was we just kept fighting for justice for the workers anyway. We called for job retraining programs. And at the same time together with the UAW, and SEIU we organized a big public forum on Blue-Green relations, in other words labor and environment coming together, and we invited local economic justice, environmental justice, and labor activists. We really took a look at, we’re all on the same side here, how do we partner even though we can’t quite see eye-to-eye? Then we sent out this press release, right, about … “We want job training for the workers, because that would’ve been so important to [workers like] Rosa,” and we get this call from the union steward who says “They don’t want job training.” If you are going to be out there advocating for our demands, can you get the demands straight? And we said “Great, what are they?” And their biggest demand, right? John Farrell: I love that, though, I just have … You went out there, and you said it, and then all of a sudden they’re like, “Well we don’t want you to say those things.” [laughing], so now all of a sudden, they’re at the table, I love it. Lena Entin: Right, right, exactly. So they said “Our biggest demand is really a bridge to retirement because so many of the workers are really close to retirement age, and if that coal plant closes sooner rather than later, we’re not gonna be able to access our retirement packages.” Right? So we incorporated those demands into our message, we wrote an op-ed with those demands, we talked to public officials, we wrote a letter to the company. When we eventually got a meeting with the company we brought over those demands. So, in some ways we were able to partner with local unions, we weren’t quiet able to partner with the workers. But we knew how important it was to continue bringing forward their demands throughout the campaign. John Farrell: I just love that story, I think it’s terrific because it’s kind of a recognition that it would be hard for anyone to step in and advocate to lose their job, and yet you were able to find a way to identify how you could, at least do something for them, at least do something that would’ve been in that direction once they were willing to accept that that’s where it was going. That the plant was going to close. So I think that’s terrific that even though you, as you said, you couldn’t partner with them directly, you did find a way to at least have a conversation about their interests. Lena Entin: Yeah, and we’re really grateful that that one worker was brave enough to give us a call and at least put us on the right track. John Farrell: When we come back, I’ll ask Lena whether the hoped for health benefits and job benefits have materialized. But first, a short break. So, I was hoping you could tell us a little bit about the end results. 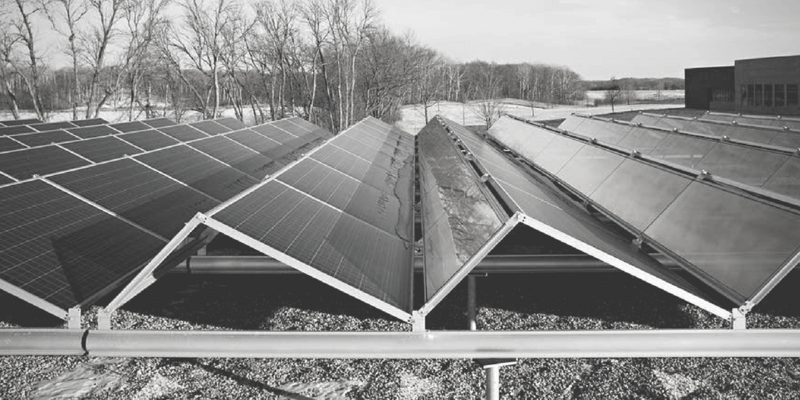 There’s this solar project that has replaced the coal plant and it’s different than just solar, there’s also battery storage, and it’s apparently one of the largest battery storage installations in Massachusetts. Can you tell me a little bit about this replacement power generation, and then what are some of the community benefits of this? What did the community get out of this given this broad focus on jobs and economic development? Lena Entin: I think to start at the beginning a little bit around solar, we worked with the city, as I mentioned, to have a transition plan in place and work with our State Senator to provide state funding, to hire a consulting group that worked with the city, set up three public forums, did a feasibility study, and at each of these public forums, we were turning about community members who were saying “We want renewable energy, we want renewable energy,” right, and the feasibility studied showed that, boy, solar would work really well, because this wasn’t woods, because this big swath of land is right on the water and so there’s all these meadows and farmland, empty farmland that’s not being farmed, so perfect for putting up solar panels, and so we started advocating for solar, solar, solar. When we finally got a meeting with the company, Carlos Rodriguez kicked off the meeting by saying to the company, “We think you should be the first in the nation to convert from coal to solar energy onsite.” And in fact the solar field is actually not exactly onsite, it’s few parcels of land away, but right near by. So we’re really excited that the company eventually agreed with us. 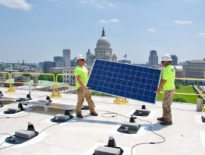 The writing was on the wall that solar was the way to go, and I think the biggest community benefit has been that Holyoke really now has this green image, and for a city like Holyoke, that has been labeled as the poorest city in the state, to be able to rebrand itself and say “Look, we are leading the way in clean energy, that the local municipally owned Holyoke Gas and Electric actually has a lot of hydroelectricity and other renewable sources,” and then, for the Mount Tom coal plant to move from coal to solar energy and then with battery storage and, as you mentioned, the largest in the state? It really boosted this image and boosted this picture of Holyoke, number one, being an energy generator, but not only that, a clean energy generator. Of course, the struggle is local jobs, right? So, that struggle continues. We certainly kept advocating during the feasibility study, and with the Mayor and the State Representative around how we could find new avenues to replace those lost jobs. And the Mayor would tell you that there are actually a couple plans in the works that are in fact big energy users. And so we’ll see if those plans come forward, and it may be that Holyoke is now seen as a site of big energy. You want big energy production? You know where to go. You want clean energy production, that your company wants to be connected to? Holyoke is the place to be. So I think in the long run, we may have helped put Holyoke on the map, in terms of recruiting employers. John Farrell: So, one of the things I was curious about was in terms of closing the coal plant, there was a really interesting story, and I think it was out of California earlier this year about some, a health study they had done after the closure of a coal plant and they were looking at, is there any way that we can see the impact, and you’ve mentioned that the asthma and the hospital visits and whatnot were such a motivating factor for folks and Neighbor to Neighbor who were helping to organize around this, have you seen results from that? I think the thing that I was thinking of in this story, they said essentially premature births fell dramatically in this community, almost immediately after the coal plant closed. I’m wondering are people feeling like there was improvement in health? And, I guess, also, did the transition plan work? Do you feel like there were jobs created? Did the transition for the workers work out well, were they able to secure retirement or whatever it was that they were hoping for? Lena Entin: Right, in terms of the shift in environmental health, we’re really eager to see some of the long term impacts because we know that over just a few years it’s going to be hard to see a shift in asthma rates, right? Because the coal plant shut down just a few years ago. But we’re eager to see in the next five to ten year range after the coal plant has closed what those health indicators will show, because Holyoke is in a valley and the coal plant has a mountain range kind of in the back side of the coal plant, really hemming in the pollution, so we’re really hopeful that we’re gonna see some big shifts in health indicators. We don’t have those numbers yet but I’m looking forward to seeing them. in terms of the job story, as soon as the coal plant shut down we reached out to the workers and said “How can we support you?” And their request was for us to talk to public officials, so we talked to Mayor Morse, we talked to State Representative Aaron Vega to ask for their support in advocating for good severance packages, retirement packages, and particularly this bridge to retirement which was nowhere in the contract. The bridge to retirement was so critical because again many of the workers were really close, and then for some of the younger workers, there was also nothing about job training in the contract, so I followed up with the workers three months after the closure. Yeah, and the really good news is that they did win the, this bridge to retirement. So the worker that I was talking to was thrilled that he had access to his retirement program. And the state representative also secured state funding for job training, and the company provided some. So one example is a worker who went off and started his own business, that he could have between now and retirement, and you can take a big risk, like starting your own business, when you already have a retirement plan in place, right? So that was the really good news. The unfortunate news is that the workers were not hired and repurposing the plant. And I know that there are workers who are, I’m sure, still out there struggling to find jobs. It’s really challenging to make a big career shift like that. So I don’t want to paint this as the magical picture where everyone’s dreams are met, but instead that this transition worked for many of the workers, and that in many ways, this was a best case scenario. And that there’s still more to figure out, right? In terms of shifting our, as we move away from some of these manufacturing jobs, there’s still more that our economy needs to figure out. John Farrell: This leads me to, I think, a really key question, which is, given what you went through in this campaign, and the lessons that you’ve learned here about their difficulty in addressing some of these needs, like for the plant workers, what advice do you have for other communities who are currently hosting coal plants that are now scheduled to close, or are likely to close? What can they learn from your experience at Holyoke? Lena Entin: I would say, first of all, in terms of if these are environmental activists or activists who don’t yet have great relationships with the labor community, to keep, to be patient, understanding, and take the high road, so continue to advocate for justice for the workers, work hard to figure out what their demands are, and to build those relationships, and to be patient and understanding, and not give up. I think that was the key. Again, I know that some workers, I’m sure, are still bitter about losing their job, but many, partly because of our support, many of these workers, who again, did their own organizing and had a powerful union, were able to secure some of the benefits they most needed. So that’s my first piece of advice, is hang in there. We are all in this together. We’re all on the same side. Don’t let these artificials decide, keep us apart. We all have the same vision of that beautiful world that we’re headed to that we know is possible. The second piece would be really to learn from other local fights. We learned so much by watching what had happened in Somerset, and in Salem. I was so thankful to be patterned with Toxics Action Center, which could connect us with the local activists in these two towns. And we could learn how to steer away from transitioning from one fossil fuel to another like happened in Salem. And we could learn that, how Massachusetts state politics work, right? That one community had secured state funding for a transition process, so that meant that we could go for it too in Holyoke. So definitely connecting with local activists, and Toxics Action Center, though, the organization is primarily in the northeast. We always take calls from all around the country, and are happy to connect and share our story. So please, find us online and connect. John Farrell: We’ll have a link on our podcast page for folks who want to both see the video and learn more about the story after they’ve listened to the podcast, but also if they want to reach out with questions. You led me into one of my last questions, which was about what public officials can do. So you mentioned that one of the things you learned there was how state politic worked. Like hey, other communities had received funds to help with transitions, so Holyoke could also ask for that. Are there other things that state legislators should be thinking about in how they support these transitions, you know? What should we be asking of state legislatures in supporting communities making these kinds of transitions? You know, and are there also things that local officials should be looking to do as well? Lena Entin: Definitely, there’s a lot that local and state officials can do, and I felt really fortunate at Neighbor to Neighbor that we had been working with our city and local officials for over a decade on economic justice campaigns, so we had built up these deep, long term relationships so that when we brought up the issue of the coal plant, we were really able to partner. And for first time activists out there who are taking on transitioning away from coal, this could be your opportunity to begin building those relationships. And I would say that in terms of local officials, it was so key that the city council passed a resolution to set up a community advisory group that would oversee the transition process, because this meant that regular folks, like one of our members, Carmen Concepción, was on the local transition committee. And this transition committee oversaw the year and a half feasibility study and reuse study process. And when thinking about our state officials, our state senator was able to secure funding for, to hire a consultant to do the feasibility study, right? And our state representative was able to secure funding for job training for the workers when the coal plant shut down. And both state officials, particularly our state representative who is a big environmentalist himself, state representative, Aaron Vega, was all, consistently also going to bat for clean energy bills at the state house, which actually helped tip the scales for GDF, who was deciding that they could actually make a profit from converting to solar energy because of state subsidies. So I think all of those pieces are key for local officials. And what was great about state representative Vega and mayor Morse in Holyoke is that both were really eager and ready to coordinate with community members because community members, we were on the ground and knew what needed to happen. And so by having consistent and strong communication, we were really able to roll out what, in many ways, was the best possible transition plan. John Farrell: So what’s next for you and for Toxics Action Center? You’re now deputy director there. You’re still on the board of Neighbor to Neighbor. Are there other plans for organizing around renewable energy as part of your economic justice work? Lena Entin: It’s interesting that you should ask because Neighbor to Neighbor and Toxics Action Center continue to partner to stop fossil fuel infrastructure and to move toward clean energy. So on the local level, we’re working to stop fracked gas pipelines from coming in, and on the statewide level, we’re partnering together for clean energy, and particularly clean energy that meets the needs, first and foremost, of environmental justice communities, i.e. poor and working class white communities and communities of color throughout the state. So that’s where we are headed next. John Farrell: That sounds great. Well, I look forward to it in a couple of years having you back on the podcast to talk about your wild successes in working to see more of that renewable energy. Lena Entin: Let’s hope so. I appreciate the vote of confidence. John Farrell: Oh, absolutely. Well, Lena, thank you so much for taking the time to talk to me. I really appreciate it. And so glad to share the story of what has happened in Holyoke in hopes that it can inspire work like that in other communities across the country. Lena Entin: Great, thank you so much. I really appreciate you spreading the word. John Farrell: This is John Farrell, director of ILSR’s Energy Democracy Initiative. I was speaking with Lena Entin, deputy director of the Toxics Action Center about the successful organizing campaign to replace the Mount Tom coal plant with solar energy storage and help coal plant workers in Holyoke, Massachusetts transition successfully beyond the plant’s closure. You can read about a New York community’s similar fight in a story at Grist about the Huntley Coal Plant in Erie County. We’ve linked to it on our show page. You can also learn what many other communities are doing to advance renewable energy in our Voices of 100% special podcast series featuring conversations with leaders from cities across the country committed to 100% renewable energy. While you’re at our website, you can also find more than 60 past episodes of the Local Energy Rules podcast. Until next time, keep your energy local. And thanks for listening. While you’re at our website finding those other interviews with Mariel, you can also find more than 70 past episodes of the Local Energy Rules podcast. Until next time, keep your energy local, and thanks for listening. A relatively small, industrial city located in the Connecticut River valley, Holyoke is home to about 40,000 residents, about half of whom identify as Latino or Hispanic. It was also home to one of the last remaining coal-fired power plants in Massachusetts, until the plant closed in 2014. Due to air pollution from this aging facility, Holyoke boasted asthma rates roughly twice those of the rest of the state. Residents started making connections between their health and economic vitality and living in the shadow of a coal plant. Joining forces with the Toxics Action Center, Neighbor to Neighbor members launched a joint campaign in 2010 to take on the Mount Tom facility and fight for cleaner air and water for Holyoke residents. But closing the plant, Entin explained, was not the only thing the community envisioned. “Carlos Rodriguez talked about gas pipelines exploding along the highway, by homes, in communities in his hometown in Puerto Rico, and was adamant that we would not let this coal plant transition to another fossil fuel burning entity,” Entin said. Indeed, the campaign had a vision early on to not only shut down the coal plant but also fight for its workers and clean up the property so that it could be put to better use. “We knew that we wanted to support the workers, and we wanted to work with the town to make sure that then that this plant was cleaned up,” Entin explained. As their campaign launched, community members from Holyoke knew they would need to be strategic and work in a broad coalition to take on the Mount Tom Coal Plant operator and owner — multinational electric utility company GDF Suez (GDF Suez rebranded under the name ENGIE in 2015). 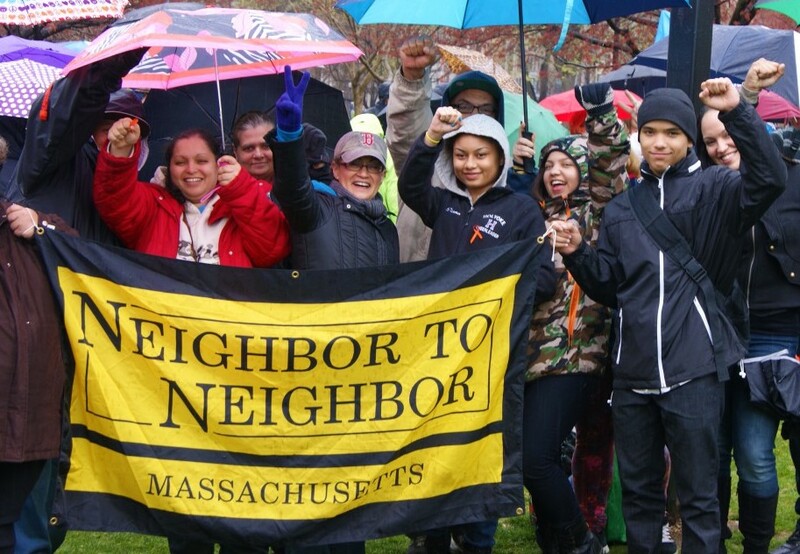 A group of Neighbor To Neighbor organizers and community members, Holyoke, Mass. “We had never taken on a company, nevermind a multinational company, the second largest utility company in the world,” Entin recalled. In addition to researching how GDF Suez — which touted a “green” image online — might respond to pressure, the campaign decided to build a strong coalition of allies before it would try to bring the utility company to the table to outline the community’s demands. While working with city officials to develop a transition plan if and when the coal plant would close, the campaign engaged local unions, including United Auto Workers, Service Employees International Union (SEIU), and Jobs for Justice, who all agreed the coal plant posed a serious public health problem. These labor groups joined the campaign’s steering committee to try to bring the plant workers — local IBEW union members — onboard. One lone worker was willing to reach out to the campaign, Entin noted, to help the organizers understand that the biggest demand from the plant’s workers perspective was not just job retraining programs but to have a bridge to retirement for those nearing — but not yet at — retirement age. “We’re really grateful that that one worker was brave enough to give us a call and at least put us on the right track,” said Entin. To help make their case, the community and city created a detailed transition plan informed by public forums and a feasibility study detailing how solar energy would be an obvious choice to replace the aging coal plant. “The writing was on the wall that solar was the way to go,” noted Entin. After GDF Suez met the demands of the community and shuttered its plant, Entin explained, Holyoke has been able to develop and boost its reputation as a clean energy leader with the goal of attracting new employers and other clean energy development locally. In addition, the company, City of Holyoke, and state legislature stepped up to provide some retraining and transition benefits to workers who were affected. But, Entin acknowledges the transition has still been a challenge for some. 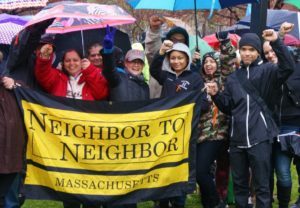 For other communities and organizers seeking to follow Holyoke’s lead in fighting for local clean energy and a just transition away from fossil fuel energy, Entin stressed the importance of building relationships — especially with the labor community. “Continue to advocate for justice for the workers, work hard to figure out what their demands are, and to build those relationships,” recommended Entin. In addition, Entin stressed the importance of working with public officials at both the local and state levels to ensure community voices are heard throughout the decision-making process and in order to secure financial resources for programs that support workers and the community. “By having consistent and strong communication [with public officials like State Representative Aaron Vega and Holyoke Mayor Alex B. Morse], we were really able to roll out what, in many ways, was the best possible transition plan,” Entin explained. Want to hear other stories of how communities are building local power and supporting renewable energy? Stay-tuned for future episodes of the Local Energy Rules podcast now every two weeks, including episodes in our special Voices of 100% series, featuring conversations with leaders from cities across the country committed to 100% renewable energy. If you’re interested in learning more, Lena Entin stressed the importance of learning from stories like Holyoke and mentioned that State Representative Aaron Vega (Massachusetts House of Representatives), Holyoke Mayor Alex Morse, and leaders from the Toxics Action Center and Neighbor to Neighbor, are available to share more about how they positioned Holyoke to lead in the new energy economy and lessons they have for how other cities can follow suit. Be sure to check out the video mentioned by Farrell and Entin during this episode, which was produced by Toxics Action Center and features even more detail about the community’s inspiring efforts. Read about a New York community’s similar fight to that of Holyoke’s in a Grist.org story about that community’s fight to shut down the Huntley Coal Plant in Erie County. This is the 73rd episode of Local Energy Rules, an ILSR podcast with Energy Democracy Director John Farrell that shares powerful stories of successful local renewable energy and exposes the policy and practical barriers to its expansion.